Got your tickets booked and paid for and your suitcase ready to go? Read on for a few basic Mouilleron-le-Captif tips before you head off. If you travel 3 miles (5 kilometers) northwest of La Roche-sur-Yon, or 5 miles (8 kilometers) southeast of Le Poire-sur-Vie, you'll wind up in Mouilleron-le-Captif. This corner of Vendee boasts a population of around 4,000 residents, some of whom will surely be willing to share some insightful travel tips. There are endless reasons to plan your Mouilleron-le-Captif trip via Travelocity! You'll pay a far lower price when you secure a package deal, and with no less than 400 partner airlines and 665,000 places to stay, you have all the freedom in the world. Want a panic-free getaway? Our Customer 1st Guarantee gives you the advantage of 24/7 personal assistance on all of our services. Have you noticed a better deal somewhere else? We'll match the price and give you back the difference^. With no hidden fees from us, there's no need to worry about having to change your itinerary. And so long as you get in quick, most accommodations don't charge fees either^. It's time to spread your wings and get inspired by Mouilleron-le-Captif, and the best place to start is with the search for a place to stay. Travelocity has 14 quality options just waiting to be booked. There's no better time to spoil yourself than when you're on vacation. Reserve a room at the Mercure La Roche Sur Yon Centre (117 Boulevard Aristide Briand) and feel like a VIP during your stay. 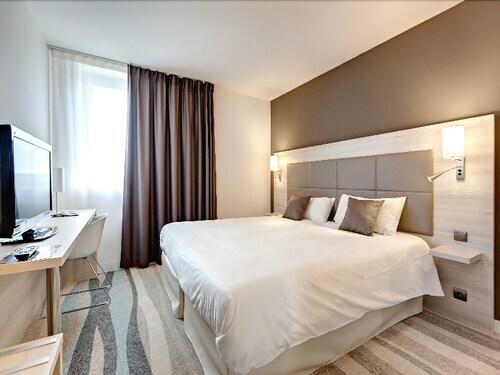 If you'd rather cut costs on your accommodations, consider a budget option like the Hôtel de la Vendée (4 Rue Malesherbes). Where do you fly into for Mouilleron-le-Captif? Coming in to land at Rene Couzinet Airport (EDM)? Once you disembark, the center of Mouilleron-le-Captif is approximately 4 miles (6 kilometers) west away. Hail a cab and take a deep breath — your getaway has only just begun! Can I rent a car in Mouilleron-le-Captif? Forget the hassle of buses, trains and overpriced cabs. If you plan to do some fun exploring while in Mouilleron-le-Captif, you ought to secure some wheels via Travelocity. We make it so simple that you'll be crafting your driving playlist in next to no time! If you're landing at Rene Couzinet Airport and would like to get a car fast, go to Avis. It's at 70 Bld Louis Blanc, 4 miles (6 kilometers) from the terminal. Make a beeline for Avis and you'll be navigating the busy streets in no time. They are located at Gare De La Roche/Yon, 3 miles (5 kilometers) from the city center. Consider yourself an art lover? Take in interesting works and try to make out the meaning behind them at La Roche-sur-Yon Municipal Museum. Still need some more options? Place Napoleon offers a space for quiet reflection. Learn about the significance of this monument and find out when, how and why it was constructed. Located 35 miles (56 kilometers) from Mouilleron-le-Captif, Haute-Goulaine is much loved by travelers. Head to this place to access the Jardin des Plantes and Chateau of the Dukes of Brittany, two fantastic attractions you won't quickly forget. If you've got the time, head only 35 miles (56 kilometers) to Nantes. This is another area with close by amazing attractions such as Nantes Cathedral and Passage Pommeraye. Located in the heart of Mouilleron-le-Captif, this hotel is within a 15-minute walk of Farmhouse of Beaupay and Vendespace. Mouilleron-le-Captif Church and Ponds Nature Park are also within 3 mi (5 km). Situated in Mouilleron-le-Captif, this hotel is within a 10-minute walk of Farmhouse of Beaupay and Vendespace. Situated in Mouilleron-le-Captif, this golf hotel is within a 10-minute walk of Farmhouse of Beaupay and Vendespace. Mouilleron-le-Captif Church and Ponds Nature Park are also within 3 mi (5 km). Situated in the city center, this guesthouse is close to Ponds Nature Park, Mouilleron-le-Captif Church, and Farmhouse of Beaupay. Nearby attractions also include Vendespace. Situated in Mouilleron-le-Captif, this hotel is within a 10-minute walk of Mouilleron-le-Captif Church and Ponds Nature Park. Farmhouse of Beaupay and Vendespace are also within 2 mi (3 km). Situated in Mouilleron-le-Captif, this bed & breakfast is close to Mouilleron-le-Captif Church, Farmhouse of Beaupay, and Ponds Nature Park. Nearby attractions also include Vendespace. 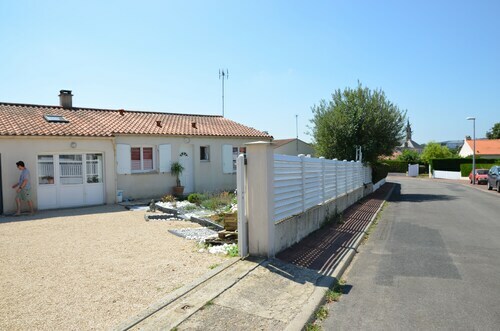 Situated in the city center, this apartment building is close to Ponds Nature Park, Mouilleron-le-Captif Church, and Farmhouse of Beaupay. Nearby attractions also include Vendespace.